The investigation into the Boston Marathon bombing has led U.S. authorities to the North Caucasus to look for links that the Tsarnaev brothers may have had with extremists there. Experts are convinced, however, that the brothers acted alone and had no links to any terrorist organization. Research into the recent terrorist attack in Boston has led U.S. authorities to the Russian Republic of Dagestan where the parents of the Boston bombing suspects live and where the elder brother Tamerlan may have had contacts with extremists. Russian media reports suggest that a party from the U.S. diplomatic mission in Moscow arrived in Makhachkala, Dagestan on Wed. April 24 to talk with the Tsarnaev brothers’ parents. The possibility was raised of the parents returning to the United States to take part in the investigation. Some reports say the American group included members of the U.S. special services. Russia is cooperating in the investigation, as agreed between Presidents Vladimir Putin and Barack Obama. The investigators are looking into the Tsarnaev brothers’ contacts in Dagestan, especially those of the elder brother who died in a shootout with the police after the bombing. Tamerlan visited Dagestan in 2012. Filatov said that Tamerlan probably had some contacts with members of a gang, which is why the Russian special services tipped off their U.S. colleagues about him, but neither side put Tamerlan under surveillance. This view is shared by journalist Ivan Sukhov, an expert on the Northern Caucasus. 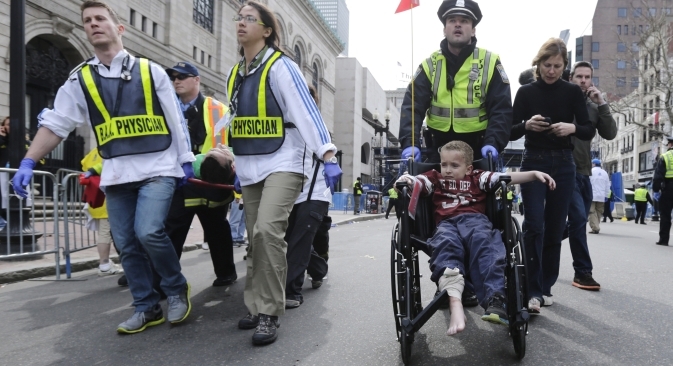 “The Tsarnaev family was apparently deeply religious, so the brothers were exposed to ideological influence," he said. "There is reason to believe that during his brief visit to Makhachkala Tamerlan Tsarnaev went to a mosque on Kostrov Street that is under the surveillance of the Russian special services. Tamerlan may have known some members of its armed wing personally." Sukhov stresses that the Russian special services are cooperating with the investigation. Russian politician Gennady Gudkov, a retired KGB colonel, also noted the importance of establishing better contacts between U.S. and Russian special services. “It was unimaginable before. The need to open FSB and FBI offices in the U.S. and Russia respectively has been mooted for years. The latest situation proves that this is necessary,” Gudkov said. He added that the Russian special services can help the Americans to clarify the circumstances under which Tsarnaevs went to the North Caucasus, what they were doing there and who they met. Gudkov does not believe the Russian law enforcement bodies committed an oversight since they passed the information on the brothers to the U.S. special services and there had been no facts or tip-offs on the Tsarnaevs. “The readiness to cooperate in investigating the Boston bombing declared by Russia and the U.S. looks like a spark that may lead to broader and more fruitful cooperation between the special services of the two countries, but I would not overestimate it significance,” said Yuri Kobaladze, former press secretary of the Russian Foreign Intelligence Service. “The fact that the FSB tipped off the FBI in 2011 about possible extremist links of the Tsarnaev brothers will certainly be helpful in strengthening not only professional ties, but in improving the climate of trust between the USA and Russia,” he said. But, Kobaladze added, the fact that the tip-off led only to a superficial interrogation and was not seriously studied in the United States should lead to a probe into all the circumstances of the use of the information received from Russia. Mikhail Starshinov, a Duma deputy and first deputy head of the State Duma Nationalities Committee agrees. “They need to sort out why not enough attention was paid to the information at the time. Russian security agencies have extensive experience in combating terrorism and their competence is not in doubt. We should improve the interaction between the two countries in this area,” Starshinov said.